Spring is the season when these organs are most active and they are associated with the functions of storage and distribution of vital energy. Liver and Gallbladder are associated with the third or Solar Plexus Chakra. The liver is the largest organ in our body; it is located just below the diaphragm on the right side above the abdomen. The liver is Yang in structure and Yin in function. This is one of the body’s essential organs, governing many digestive, circulatory, and excretory functions. The liver converts carbohydrates, fat, and protein into one another, and manufactures hormones and enzymes. The liver processes fat, and stores and distribute vital energy. It also analyzes and detoxifies the body by filtering the blood, stores nutrients and keeps us strong to fight against disease. It is the organ most sensitive to stagnation, and helps maintain harmony and movement throughout the body. The conditions of the liver can be seen in the thickness, color, texture and strength of the nails, the eyes and vision. The liver meridian starts on the big toe and travels upward on the inner side of the leg then in the inside of the body and ends at the eyes. So the liver is related to the health of the eyes and vision and their disorders. The liver rules over the tendons, the Achilles tendon and the nerves. The liver stores vitamins A, B, D, E and K so the body can go for long periods of time without showing signs of deficiency. The liver controls bile secretion and regulates the blood. The liver helps to harmonize the emotions. Loss of vitality: sudden spurs of vitality and motivation, followed by extreme fatigue. Bad temper: high emotional sensitivity, tendency to raise one’s voice. Cirrhosis: Chronic alcohol consumption damages the liver until the progressive destruction of the cells gets so extensive regeneration is impossible. The liver becomes smaller and hard, and the Spleen becomes enlarged. The person looses appetite and suffers from fatigue. Cirrhosis may also cause a build up of fluid in the protective layer around the intestine. Jaundice: The excessive bile gives the entire body get a yellowish hue, including the whites of the eye. This condition can result from the obstruction of the bile ducts or a breakdown of red blood cells. Hepatitis: Hepatitis is an inflammation of the liver, most often caused by a virus that destroys patches of liver tissue. Alcohol and drugs can be the cause of this disorder. To cure Liver problems we need a lot self discipline; it is best to keep oil and fat intake to a minimum. Fermented foods are beneficial; eating sour food is good for liver health, especially during the spring time. Sauerkraut, Radishes, Daikon, fermented umeboshi plums and lemon juice, and naturally fermented foods have a dispersive effect on the tight liver energy. 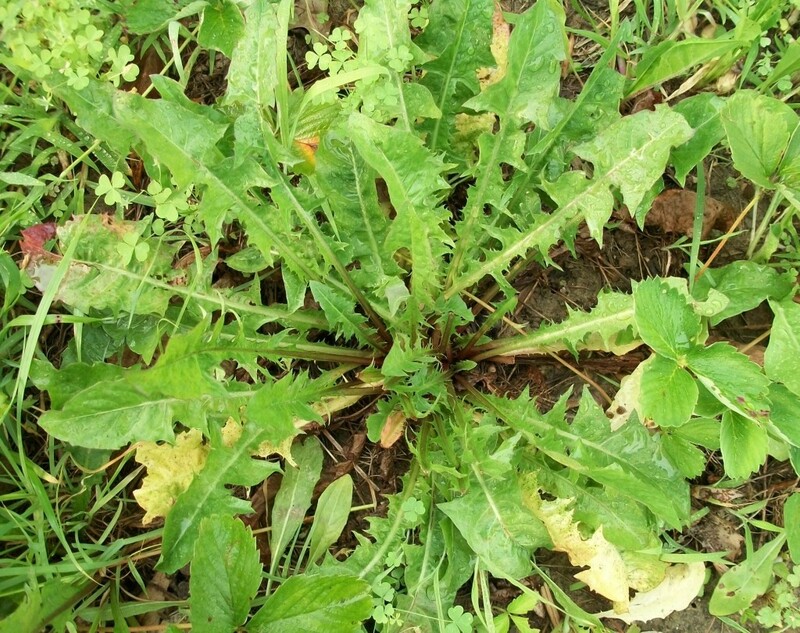 Chicory leaves, Dandelions (taraxacum officinal) are the best greens. The long and flat leaf correct disorders of the Liver and Gallbladder. These plants have medicinal powers, are useful to counteract hyperacidity and help normalize the alkalinity of the body. They are high in potassium, calcium and sodium, and it is our richest food in magnesium and iron content. Mix Chicory leaves in salads, or cook them as a side dish. In early spring, take 6-7 dandelion flowers with the stem, wash them and eat only the stems for 2 weeks every day. It brings relief for chronic inflammation of the liver. For those whom are always tired and without energy, Dandelion flower stems are a wonder of relief. It also improves the stomach gastric juices and helps to clean the waste material accumulated in our digestive track. Chicory gives relief to gall stones because it helps remove them, also brings relief to gout, jaundice and spleen disorders. Endive is closely related to the Dandelions plant, and its chemical constituents are more or less alike. Endive however is a curly leaf vegetable resembling lettuce with a added nourishment that is needed by the optic nerve and helps correct eye defects and vision. Miso soup has a cleansing and detoxifying effect for the liver, two years old fermented dark Barley miso must be used because it is medicinal. Shellfish clams and oysters are also beneficial. Smooth flowing liver energy is a sign of a happy person; they have more patience, and are slower to anger. Eat less and get up from the table still little empty. If the liver energy is too tight it is because the liver has to store too much fat caused by overeating and not fasting. Fasting for 4 to 5 days helps to clean the liver from the fat and heavy food eaten during winter time. Fasting in early spring is a practice recommended in all ancient religious books, because it has a cleansing effect on the body and mind. Every body needs oil, but the right amount of oil is very individual. If a person is constantly snacking, it may be too little oil in their diet. A person with dry skin needs to lower the oil intake, or change to a more yin type like Olive oil. Liver problems are yang, so it is better to abstain from eating animal foods because they are high in protein and fat. Use grated daikon, it has a sharp taste and it is good to melt away accumulated fats. To have a more mild taste mix grated daikon and grated carrot. Dry Shitake mushroom tea is very beneficial for liver tension. Raw carrot juice + celery juice + and little parsley juice has a very medicinal effect on the liver if taken in small amounts. Drinking a pint of Carrot, Celery, Endive and little Parsley juice daily is very good for liver and Gallbladder dysfunctions, is also very beneficial in conditions involving the spleen. The gallbladder is Yin in structure and Yang in Function. The gallbladder meridian is the longest in the body, it starts from the face, travels to the top of the head, around the ear on the side of the scull, travels around the scapula and the shoulder down to the inside of the torso, to the outside of the body and legs to end up on the forth toe next to the little toe. The gallbladder is a small muscular organ that stores bile, the yellow liquid produced by the Liver, and controls the distribution of nutrients throughout the body. This is the organ connected to decision making. Having the Gallbladder removed effects the ability to make decisions, this type of person can get overly concerned about small details, lose the big picture of things. The fat metabolism is also compromised because without this organ, the liver does not have a place to store the excess liquids (bile) that produces and it has to work so much more to dispose of it. Eye diseases, glaucoma, and night blindness. The Gallbladder effects the condition of the pancreas; the two organs have their ducts very close to each other. The Gallbladder also affects the condition of the spleen. Disorders and excesses of the gallbladder invade the spleen, liver and stomach. The results are headaches at the base of the skull and ankle pain. The most common gallbladder problem is gallstones and blockages along the gallbladder meridian. Gallstones may obstruct the flow of bile from the gallbladder causing pain or inflammation. The gallstones can also get stuck into the bile duct and could cause jaundice by blocking normal flow of bile to the intestine. The stones can be soft or hard, smooth or rough, small like sand, or big as a ping-pong ball. The blockages could lead to inflammation, infections and damage of the gallbladder, liver, pancreas or small intestine. Eat whole grains, non refined grains nourish the Gallbladder. Eat organic grown food because pesticides and chemical fertilizers irritate the gallbladder. Minimize fat consumption, and reduce oil. Avoid and minimize animal food. Leafy greens help to release stagnation. Little amounts of Barley malt release tightness of the gallbladder. The greens that all gardeners call weeds and they kill with weed killers, are extremely good for our Liver and Gallbladder health, We can add them to mixed salads or cook it by boil it and saute it. Wash and clean a bunch or two of Dandelions. Bring to a boil a quart of filtered water. Put the greens into the boiling water. Boil for 5 to 10 minutes, until they look and feel tender. 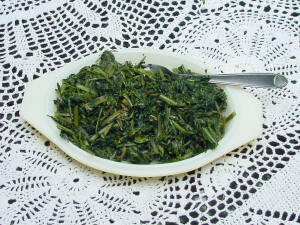 Take the greens out the pot with a slatted spoon and plunge immediately into a bowl with plenty of cold water to cover. Take a bunch of the leaves with your hand, make a ball and squeeze with both hands to remove the extra water and some of the bitterness. Put on a cutting board and chop the greens up in small peaces. Saute olive oil and garlic until golden in color, then add the blanched greens and cook for 5 to 10 minutes, adding a little water if needed, near the end, add soy sauce or sea salt. Continue to cook for a minute and serve. We add them in soup, vegetable dishes, stews etc. 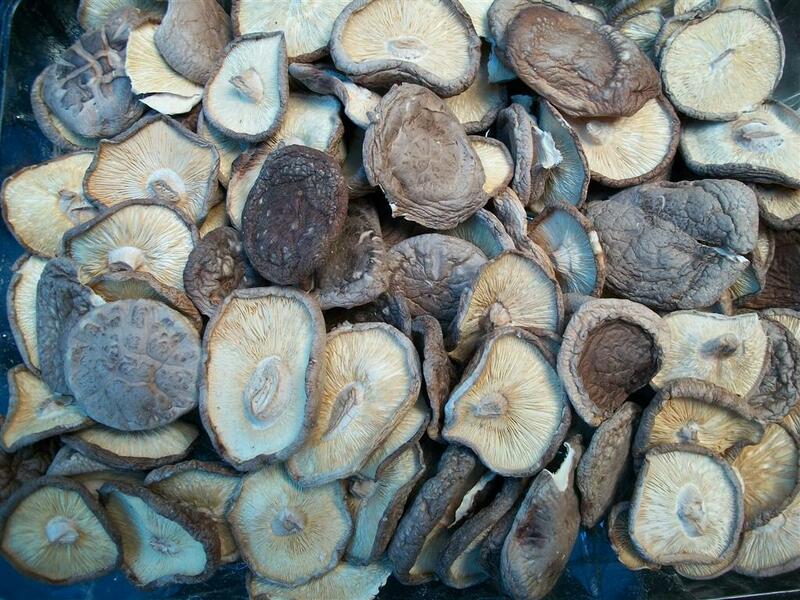 We use shiitake to make a tea that help to reduce fever, dissolve animal fat and relax the body. Place water and the cut mushroom into a saucepan, bring to a boil, lower the flame and simmer 4 to 5 minutes. Add Shoyu or Tamari. Drink warm.